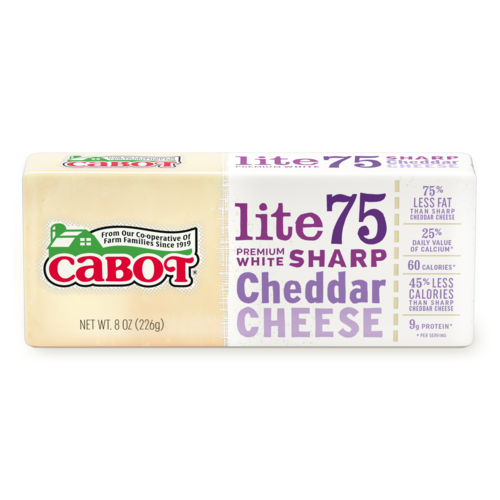 Have you been looking for creamy, cheesy, buttery flavor without the fat and calories? Well, you've found it! So creamy, buttery, and suprisingly savory, you won't believe this is a light Cheddar! 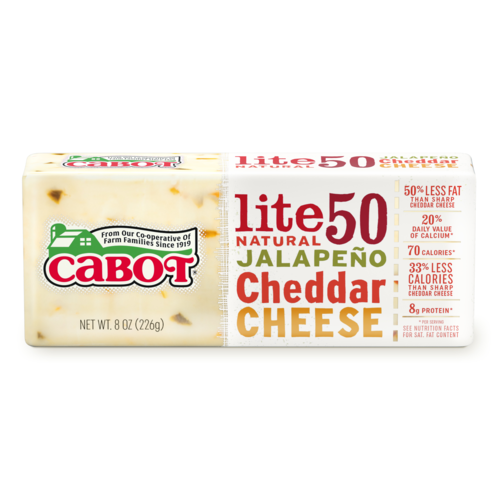 Ingredients: Pasteurized lowfat milk, cheese cultures, salt, enzymes, annatto (if colored), Vitamin A palmitate. 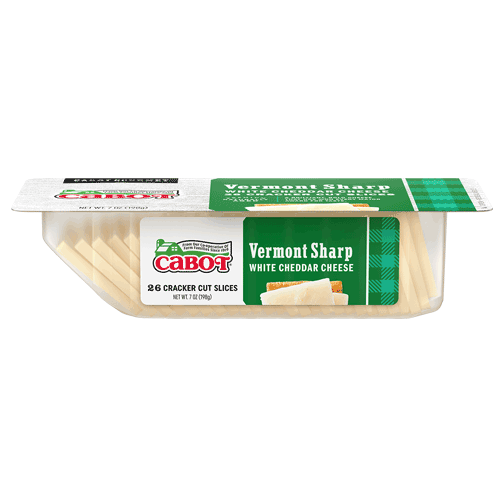 Have you been looking for creamy, cheesy, buttery flavor without the fat and calories? Well, you've found it! It boasts some impressive stats: only 70 calories per 1 ounce serving, and 4.5 grams of fat. 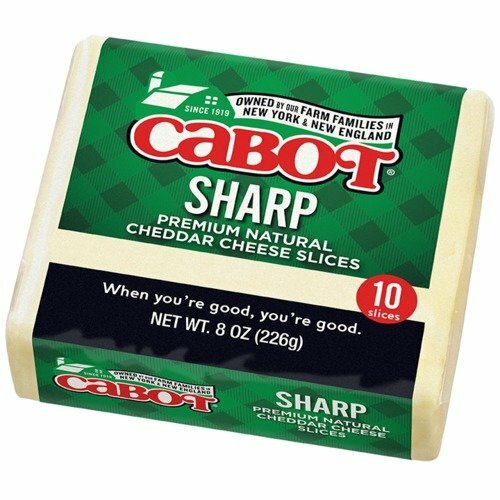 The best part is, you'll notice the signature bite of Lactose-Free Cabot Sharp Cheddar. With a smooth firm texture it is surprisingly savory. Start your day off right and melt it inside a vegetable omelet. 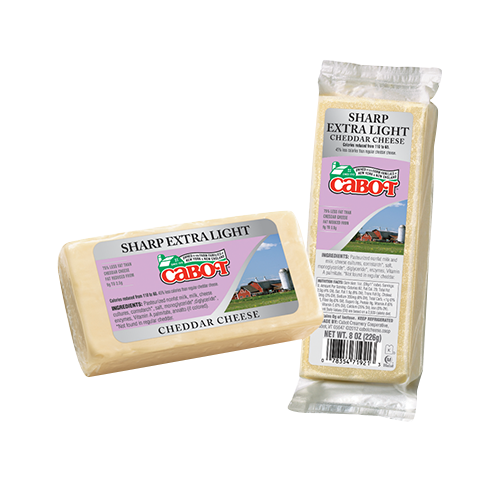 Ingredients: Pasteurized lowfat milk, cheese cultures, salt, enzymes, Vitamin A palmitate. 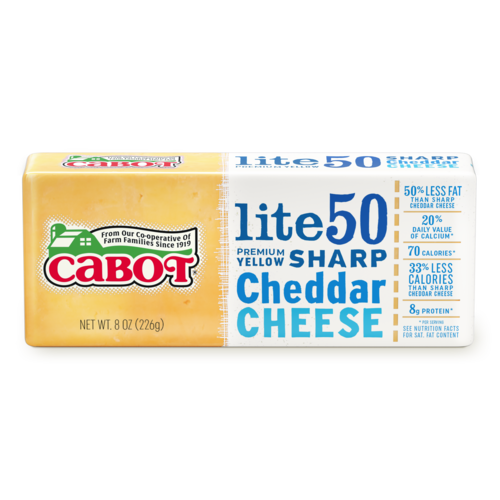 Available ready for slicing and serving in our convenient Deli Bar, Lactose-Free Sharp Lite50 Cheddar is all the nutty, tangy cheddar flavor you crave without the extra fat. Try grilling it between two slices of whole grain bread for a healthy take on grilled cheese, or melt it over broccoli or cauliflower to add a little burst of creamy, cheesy goodness to your daily veggies! 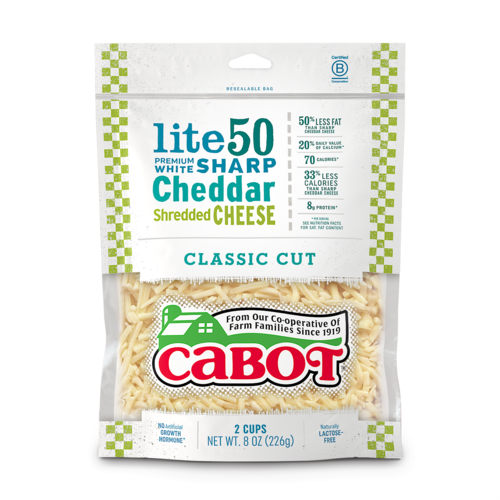 Our delicious Lactose-Free Sharp Lite50 Cheddar Cheese is easier than ever to add to your favorite recipes when you pick up an 8-ounce bag of the Shredded variety. 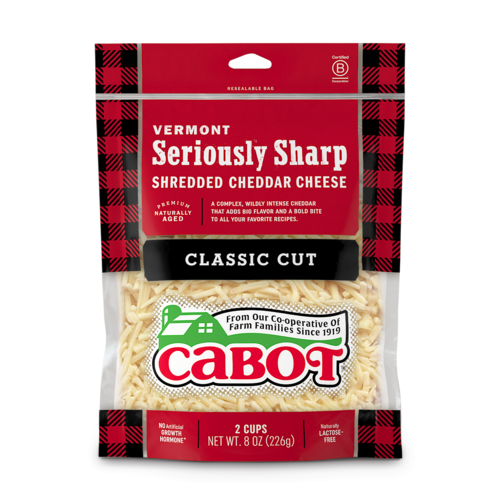 Sprinkle these yummy shreds over macaroni or add to a baked potato, and enjoy the sharp bite and smooth texture of gooey melted cheddar with fewer calories and less fat! 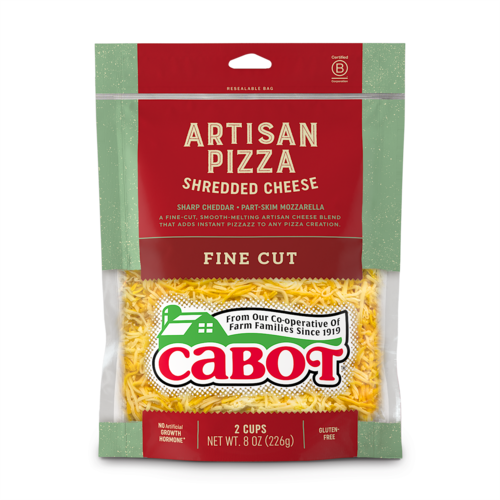 Ingredients: Pasteurized part-skim milk, cheese culture, salt, enzymes, Vitamin A palmitate. Potato starch, corn starch and calcium sulfate added to prevent caking. Natamycin (a natural mold inhibitor). 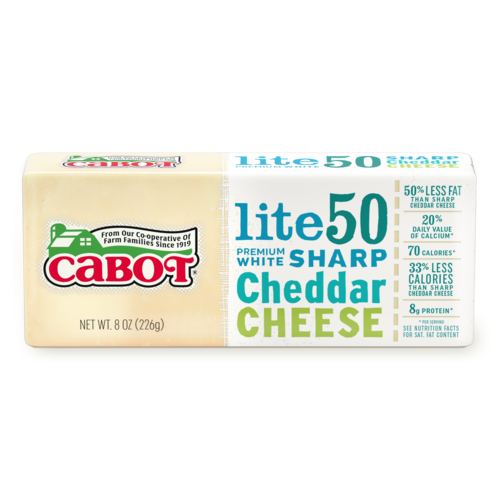 For health-conscious families on the go, Lactose-Free Sharp Lite50 Cheddar Slices save time without skimping on taste! 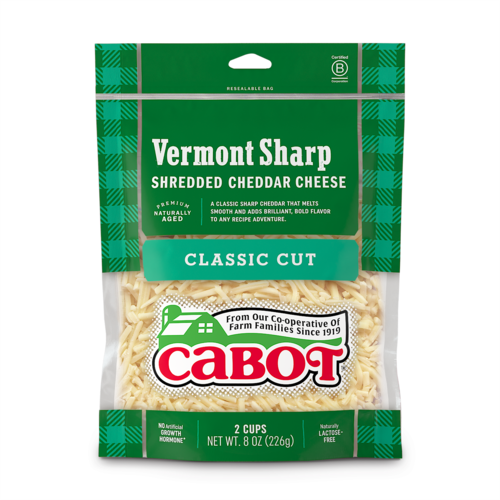 Our 8-ounce package contains 10 individually wrapped slices, so you can dash off a few lower calorie ham-and-cheese sandwiches and dash out the door. 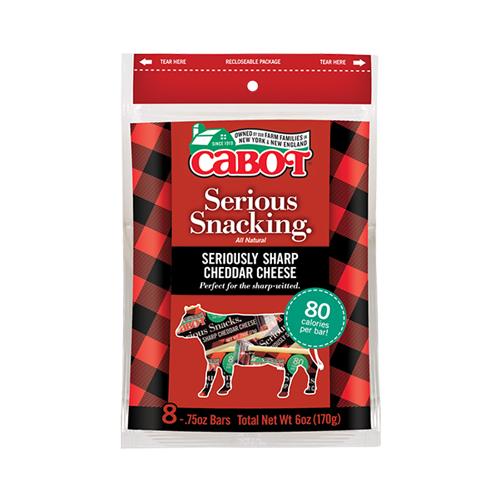 At only 50 calories each, our package of 8 individually wrapped, 8-oz, Lactose-Free Sharp Lite50 Cheddar Serious Snacking bars are small morsels with big taste! 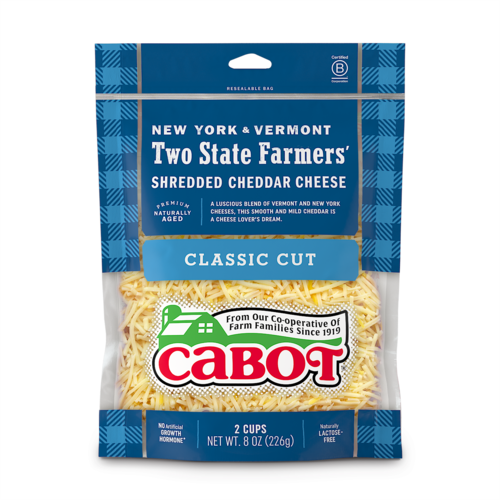 Toss a few in your bag or lunchbox and head out the door, knowing that if hunger strikes, you're equipped with all the tart cheddar taste in a healthy little package.